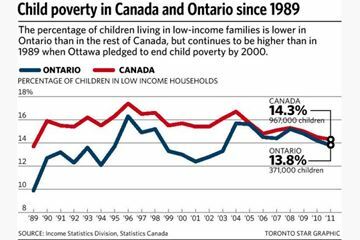 Almost a generation after Ottawa’s vow to eradicate child poverty by 2000, national and provincial report cards show very little sustained progress. One in seven Canadian children — or 967,000 — still lives in a low-income household, according to Campaign 2000 in its annual report being released Tuesday, the 24th anniversary of the historic federal pledge. In Ontario, child poverty rates mirror the national average, with about 371,000 children living in poor households, says the group’s provincial report card, which is also being released Tuesday. Alarmingly, 38.2 per cent of children of single mothers in Ontario are living in poverty.